Yellow straw color. Fruity, earthy aromas and flavors of spiced apples and pears, nougat, lemon yogurt, and hint of rubber with a silky, tangy, petillant, fruity sweet light-to-medium body and a smooth, interesting, brisk finish revealing notes of honey peach and lime and peach-apple relish with fine, crunchy tannins and no oak flavor. A crisp, refreshing sweet wine that will be great with cheeses and desserts. Bottom Line: A crisp, refreshing sweet wine that will be great with cheeses and desserts. 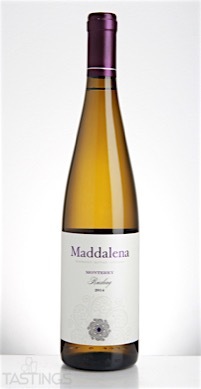 Maddalena 2014 Riesling, Monterey rating was calculated by tastings.com to be 90 points out of 100 on 9/12/2016. Please note that MSRP may have changed since the date of our review.